What is your cash flow situation? Companies with a robust cash flow can better afford down payments or outright cash purchases than those that do not. Renting equipment, whether long or short-term relieves cash flow pressure. 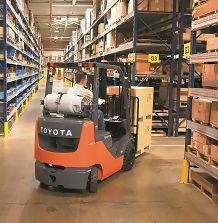 Toyota Forklifts of Atlanta has the equipment you need and can provide you with a wide variety of equipment acquisition options. From short-term and long-term renting, leasing and financing, we will be able to provide you with the best combination of equipment and acquisition methods to suit your financial and operational requirements. Contact us today at 888-550-6836 for a consultation with one of our Equipment Specialists.